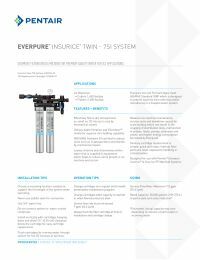 The Everpure EV932472 is a sediment filtration system specifically designed for ice applications. This system uses twin 7SI catridges that feature superior dirt-holding capacity through its depth filtration and Fibredyne™ media. 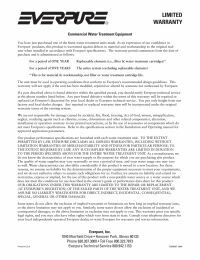 These filters effectively removes dirt and other sediment as small as 1/2 a micron through mechanical means. The 7SI cartridges greatly enhance the capacity of this unit up to 50,000 gallons, and can produce 1450 lbs per day of ice cubes. These filters will also reduce ice machine maintenance, service costs, and dowtime by removing scale buildup and other damaging contaminants. The filters should be replaced every 6 months for maximum performance. NOTE: Save electricity and boost your ice production volume with the compatible ChillTech Heat Exchanger.